This ugly incident on a Winnipeg bus in which a woman with an intellectual disability was sexually assaulted on public transit without her government funded caregiver even noticing should be part of Alberta’s ongoing PDD conversation. In Alberta, too, front line workers providing services for people with disabilities are employed by private enterprises. Those workers have a high turnover, are often paid minimum or slightly above minimum wage and often have minimal training. They report to a number of layers of (higher paid) management within those private enterprises. The private enterprises, in turn, report to social workers employed by the government. These social workers have a number of managers, etc. above them all the way up to the Minister. When the Government talks about all the money it is spending on services for people with disabilities, the only money it is really spending on the clients is the small amount that goes to the low wages of the front line workers. Don’t get me wrong. The workers I’ve known, both on the front lines and back a bit in the trenches are dedicated, hard working people — but woefully underpaid. My quarrel is not with the workers at any level, privately or publicly employed. My quarrel is with the absurd multiplication of administration and the pay imbalance between administration and actual service delivery, and with the apparent inverted pyramid structure of the whole system, with vast numbers of higher level managers with job security, and a desperate scramble at the bottom to get the actual work done by a small, rapidly changing cohort of low paid, sometimes minimally trained workers. And my quarrel is with the fundamentally and tragically flawed but very popular notion that private enterprise will in every situation do things more cheaply, more efficiently, and simply better than government. I’ve vented my spleen about PDD before, here and here, but, I feel compelled to continue. If I were running the circus, the front line workers would work directly for the government, be unionized, paid well, and the private “not for profits” with their well-paid directors would be cut out of the loop. The fact that a load of administrators and managers, who never actually have even to meet their clients, get paid relatively big bucks, while the people who actually provide the services get paid a pittance is a disgusting insult, and shows exactly who the government thinks is worth the most money. As long as the monetary emphasis of PDD is on administration rather than on providing care and services to actual people with disabilities, those with disabilities will remain horribly vulnerable. Change is desperately needed. Anne Carson’s Nox is a brilliantly moving contemporary development of the elegiac mode, a heart-wrenching epitaph for the brother she hardly knew, a devastatingly close reading of one of the Ancient World’s finest poems, an insightful musing on the process of translation, and, in the end, a simply exquisite object, a physical book which should put an end to elegies on the demise of physical books at the hands of e-books. Don’t kindle the funeral pyre for paper any time soon! Nox is, to simplify, a photographic reproduction of the pages of a notebook Carson assembled as she came to terms with her brother Michael’s death and with the long absence that preceded it. The object is an accordion folded codex, much like the surviving codices of the pre-Contact Maya. This book fits neatly into a well-constructed grey book-shaped box. The author’s name and the title, along with a slim cut-out photo of Michael as a youngster are on the top of the box, the front cover of the “book”. The contrast of the swim-suited youth, giant swimming goggles covering his eyes, and the word “Nox” (Night) — especially when the youth’s exaggerated contrapposto pose is noticed — tells us clearly that this poem is a funeral oration, both for the brother and for Youth itself. The pages themselves are minimalist collage. I thought immedieately of the notebooks of Peter Beard, but Carson’s notebook has none of the baroque busyness of Beard’s work. Each of Carson’s pages has a bit of text pasted in, perhaps a bit of a cut-out photo, sometimes hand-written notes or letters. On the verso (if one reads it as a book rather than stretching the whole out as a ribbon) of almost every “page” Carson provides a long definition of a Latin word. These words are together are the text of the poem known as “Catullus 101”, by the 1st Century BCE Latin poet Catullus. 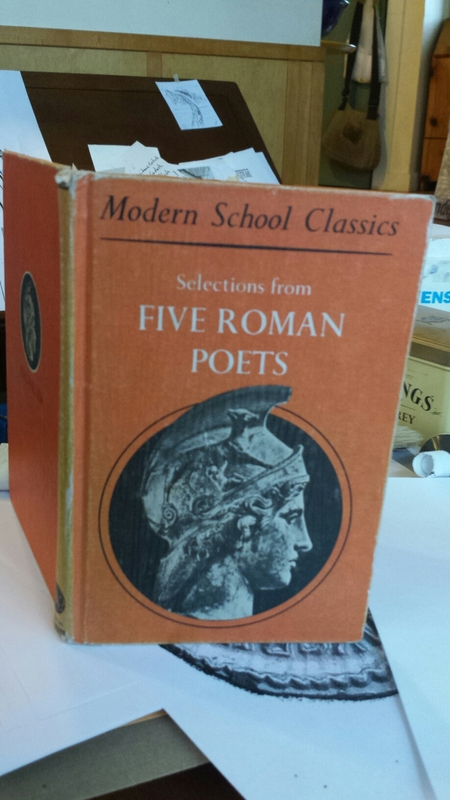 Of the five Roman writers represented in this book, Catullus comes nearest to our English conception of a poet. His best work is seen in short, intensely personal lyrics, such as are so common and so popular in English poetry, and he has been compared to such self-revelatory poets as Shelley and Burns, and to the Greek poetess Sappho. No one (even in Latin) can approximate Catullan diction, which at its most sorrowful has an air of deep festivity, like one of those trees that turns all its leaves over, silver, in the wind. Carson’s elegy is absolutely post-modern, and brutally moving. About three quarters of the way through Nox, Carson offers her translation of Catullus 101, still a tentative translation after a long career as Classicist and poet. I find it interesting that Carson’s translation appears again on the final page as a water-smudged palimpsest of itself, perhaps in differing versions, to me a comment on the falibility of memory, or of experience’s effect on meaning, or so many other things. Over the years of working at it, I came to think of translating as a room, not exactly an unknown room, where one gropes for the light switch. This passage struck me most personally because I have myself wrestled for thirty-five years with the process of translation. What I might add to Carson’s description is that you may not always be quite sur what a light switch is. And I realize now that Carson is also describing Life, and a life. Nox is a simply beautiful expression of personal mourning reflected in a two thousand year old mirror. That reflection, that echo across millennia and cultures helps to make this very personal, sparingly described life and mourning into something universal. I suspect, although, as a reader of Latin I cannot know, that Carson has extended this universality to — has translated it for the contemporary reader ignorant of the Latin language. And, again, Nox is a stunningly beautiful art object, a brilliant achievement of the mass-market publishing industry. Anne Carson’s Nox is a moving tribute to the brother she hardly knew. The object is a triumphant victory ode to the physical book, still able to do so much more than an e-reader. 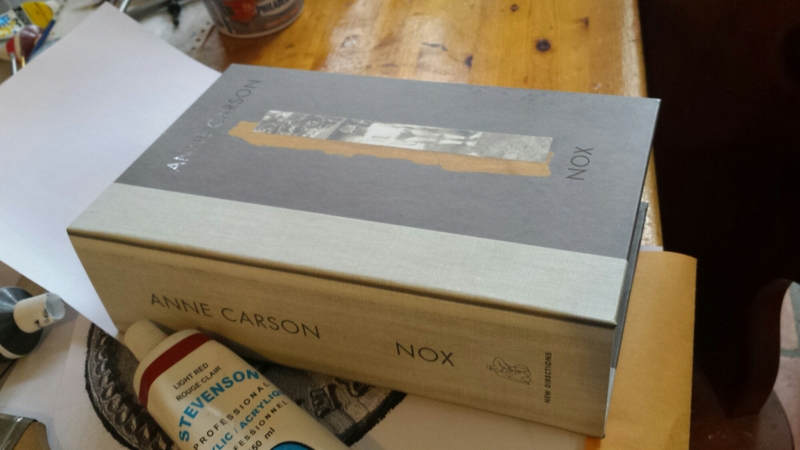 Anne Carson’s Nox was published in 2010 by New Directions (by Penguin in Canada). As a lover of poetry, a student of Catullus and of elegy, a hoarder of books, a dabbler in design, I will treasure Nox. I think you might, too. I love living in Edmonton. Pretty much everybody I know thinks Edmonton is the bee’s knees, or so they tell me. I often tell people, both here and far away, that I’ve never been to or heard of a place I’d rather live than here on this block tucked between Old Strathcona and the Mill Creek Ravine, on the edge of the centre of Edmonton. So, I don’t get why the online comments stuck at the bottom of Edmonton news stories are so often a series of diatribes against the city, half-witted name-calling directed at our elected officials, and complaints about winter or God knows what. Seriously. He hates a metropolis of over a million people, a city where there are constant festivals of arts, dance, theatre, literature, sports, food; a city where people harvest grapes and strawberries from back yard gardens well into October, a city with more frost-free days than Calgary to the south — he hates this city because there’s a busy outlet mall at the edge of town when we don’t have the perpetual summers of currently burning California! I don’t get why young people in Thomas Wharton’s creative writing classes “hate it here.” Mr. Wharton should mention to his classes that great novelists wrote about London and Paris and New York not because those cities were great, but because they knew those cities and by writing, helped to make the cities great. When I read about Mr. Wharton’s students, I think of my University friend, Chris, who, back in 1983 hated Edmonton and was desperate to get back to Toronto. Within a few years she was in an apartheid era South African jail, as it turns out. I don’t think she ever spent much time back in Toronto, but before her death about a year ago she helped in her small way to end apartheid and continued to the end helping to improve her adopted country and continent. My friend Chris, it seems, very quickly lost her hatred of places other than Toronto. Indeed, she found herself, through force of circumstance, in one of the most oppressive locations in the world, one of the most un-Toronto and un-Canadian of societies (ignoring for the moment the lessons drawn by South Africa from Canada’s “solution” to the “Indian Problem”). And Chris made herself the centre of a lifelong effort to improve the lives of girls and women in Africa, beginning with her adopted daughter. Imagine: a White Canadian ex-pat adopts a young Zulu girl in apartheid South Africa! Chris went ahead as if apartheid didn’t exist. Within a few years, Chris was interviewing Nelson Mandela for a biography, and her daughter was sitting in Madiba’s lap, and Apartheid really didn’t exist. I find these two concepts to be key to understanding something that I sense to be happening in Edmonton. This city is absolutely bursting with imagination, and, perhaps to a similar extent, is filled with profound social vision. And the most powerful force in Edmonton right now is an unusual urgency in many citizens, from regular working people right up to the Mayor and Council to behave every day As If their dreams for their homes, their neighbourhoods, and their city were Reality. This is the urgency my friend lived in Durban as a young working mother and every day of her life. Vaihinger’s As If philosophy has somehow become — maybe always has been — the unstated philosophy of the movers and shakers of Edmonton. In our last municipal election, Josh Semotiuk, a bearded thirty-something electrician and fan of Motorhead ran for mayor. Everyone in the city, not least Josh, knew he wouldn’t win, but he and the other candidates consistently acted As If @josh4YEGmayor were a Twitter handle that could easily change to @joshYEGmayor. And, in his Motorhead T shirt he made good points at candidate forums, cutting through dross that often appears at such events, and made the campaign more honest than it might have been. In the end, the forcefully optimistic (and very tall) Don Iveson won the election. He and his Councillors have spent their first year in office acting As If every citizen has tremendous ideas, As If citizens all have a perfect right to button hole any one of them at the Art Gallery of Alberta, on the sidewalk, or on Twitter, and As If Edmonton is the Best Place To Be. And a whole lot of citizens are acting that same As If philosophy. I suspect this As If philosophy has been a part of Edmonton’s social DNA from the time of the Fort up on the river bank and from the earliest meetings of Nations at Pehonan. Even in the grey, windswept downtown days that cause my friend in Seville to still refer to our city as “Deadmonton”, there were those like Mel Hurtig and Joe Shocter and dapper Englishman John Neville who imagined, and acted As If we were the Metropolis of Tomorrow Today. Because we have lived As If, our multicultural, diverse country has become a reality. I would argue that because my friend Chris, and countless others, acted As If apartheid didn’t exist, Nelson Mandela became President. And because Joe Shocter acted As If cold-calling a great British actor would actually bring the man to Edmonton, John Neville walked the boards at the Citadel. And because John Neville acted As If Edmonton were the centre of the theatre world, Brent Carver and Nicky Guadagni pulled up stakes from Toronto and London to play Romeo and Juliet to crowds of Edmonton theatre goers. And those crowds acted As If they were worthy of the performances, and so they were. In my years living in this little neighbourhood I’ve gotten to know business people, actors, writers, poets, visual artists, construction workers, nurses, teachers, musicians, doctors, pharmacists, politicians . . . all the varied individuals that make up any city — or village. Many days I hear impotent bellyaching about potholes, the new arena, the old airport, or the weather. But every day I see people in Edmonton doing the As If thing. I see it at the art galleries like Latitude 53 and dc3 Art Projects, at theatres from the Walterdale to the Citadel. I see it from furnace installers, reno guys, home builders, butchers, baristas, booksellers, municipal politicians. I see social engagement in artist like Dawn Marie Marchand and Aaron Paquette, in writers like Todd Babiak, in business owners like Kim Fjordbotten of the Paint Spot, campaigning tirelessly for #yegarts, and in a very shy butcher I know who is obsessive about business expenses and yet provides hot lunches at cost to kids at the school across the street from his shop and thinks Edmonton is both the bee’s knees and the cat’s pyjamas. I see Steve and Sharon Budnarchuk, owners of Audrey’s Books, successfully carrying on As If ebooks, Amazon and big box stores didn’t exist. And all the artists of the Nina Collective who act As If making art is human nature for all humans and so make it true every day. What a gap there would be in Edmonton if not for the Spinelli family acting As If Edmonton were a little piece of Italy and creating the Italian Centre Shop. And consider the Carrot Cafe and the people of the ‘hood around 118 Ave. They acted As If they had the coolest part of town, a centre for festivals and the arts, and you know what? Now it’s cool, and KaleidoFest is one of Edmonton’s most brilliant jewels. Thirty years ago Brian Paisley acted As If Old Strathcona was the greatest theatre hot spot in North America and The Edmonton Fringe Theatre Festival, the greatest theatre festival in North America, was born. A century ago, Edmonton’s municipal government acted As If their little northern city were bigger than the Big Apple and set aside the biggest urban green space on the continent, our unbelievably beautiful River Valley Parks. A few years ago my friends Carlos and Bernardo came to Edmonton from Mexico. They bought a convenience store and acted As If Edmonton absolutely required a wickedly great Latin American grocery store. A few months ago Tienda Latina doubled in size. And the Bissell Centre. . .
And the Hope Mission. . .
And the thousands of marvellous, huge, tiny, fun, beautiful and moving things happening in this city. When I read Adrienne Clarkson’s Massey Lectures I feel like I’m reading a description of Edmonton, particularly when she discussed Vaihinger’s philosophy. As my friend Chris did when she found herself living under Apartheid, a critical mass of Edmontonians act As If the place we live is how we want it to be for ourselves and others. And through that act, we make it so. While I’m no particular friend of the strange things done under the midnight sun by the men who moil for oil, and while I’m no enemy of the hope of better living through technology, I have no illusions that hydroelectric megaprojects are a fine, clean, green power line to a happy future. So, a quick reality check. As of 2013, according to the Pembina Institute, the six active surface extraction projects in the Alberta Oilsands have disturbed about 715 km² of boreal forest. The companies conducting the extraction are required by law to restore that land to “equivalent land capability” when they’ve finished the mining. Whatever one may think of the possibility of such restoration, or of government’s ability to enforce such a requirement, the gesture has at least been made toward “leave it like you found it”. In contrast, Site C will destroy through flooding a horizontal surface area of 93 km². Because of the mountainous area involved, the actual ecological area destroyed will be much larger. The governments have acknowledged in advance the “significant adverse environmental, social and heritage impacts.” They even acknowledge that this “clean” project will result in greenhouse gas emmisions from the rotting vegetation – a carbon sink before the flooding – for years afterward. There are no requirements to return the land to its previous state. The project is permanent, the destruction is forever. So, with a single megaproject British Columbia intends to destroy forever an area 1/7 the size of all surface extraction projects in the Alberta oilsands. Somehow this permanent destruction is claiming the “Clean Energy” label while confessing “significant environmental” impacts. By the way, B.C.’s W.A.C. Bennett dam, completed in 1968 in the spirit of utopian, nature-controlling High Modernity discussed in my earlier post, has already destroyed twenty times the area Site C would destroy. That’s almost three times as much natural area destroyed by one hydroelectric dam as has been strip mined – with the legislated requirement of restoration – in Alberta’s tar sands. The oilsands companies and the Alberta Government, for all their flaws and self-interest, at least grudgingly acknowledge that when one makes a mess, one has the responsibility to clean things up as best one can. I’m glad I have visited the beautiful valley of the upper Peace River. Before long, it will be gone forever. Update, December 3, 2014: Yesterday an outfit called Clean Energy Canada made a lot of headlines with a report on “clean” jobs in Canada, specifically contrasting direct employment in the Alberta oilsands vs. direct employment in “clean” energy. What got little coverage was that the report admits that 85% of the electricity they class as “clean” comes from Big Hydro mega-projects, specifically singling out Robert-Bourassa in Quebec, part of the once notorious James Bay Project. The Robert-Bourassa reservoir destroyed almost four times the area of Boreal Forest strip mined in the oilsands. What is being ignored by Clean Energy Canada is that these Hydro mega projects they are praising have a far more disastrously direct destructive impact on Canada’s Boreal Forest than do the strip mines in the tar sands. Sure, once the mountains have been mined for limestone, once the carbon has been belched in the production of concrete, once the initial destruction is completed, once the carbon sink is destroyed and its stored carbon released to the atmosphere, once the power lines are cut through the forests, the electricity from these things is “renewable” for the life of the project. But, at some point, silting, maintenance costs, changing demand, etc. will lead to the decommissioning of these projects. What happens then? Who cleans up the mess left by this “clean” energy? As a further reality check, China’s much maligned Three Gorges Dam, directly destroyed by flooding 1,045 square kilometres. The first phase of the James Bay Project, which Clean Energy Canada touts as “Clean Energy”, directly destroyed well over ten times that area, 11,300 square kilometres of pristine Boreal Forest. I think Clean Energy Canada does a tragic disservice to the very industries they are trying to help when they include such grandiose terraforming megaprojects in their definition of “clean” energy. Does anyone remember the shock and horror of the world when China’s Three Gorges Dam went ahead? The extinctions of river dolphins, the displacement of millions of people, the destruction of thousands of years of human heritage and millions of years of natural heritage with a single megaproject that Clean Energy Canada would seem to class as “clean.” How many of the well-meaning, devoted environmentalists gleefully tweeting news of the “Clean” jobs report would be so excited if they realized that Site C is considered a “clean” project? It’s truly encouraging that low-impact energy sources are growing in importance, but fudging a report by including “It’s humanity’s planet, we’ll do what we want with it” mega-projects in the set of “clean” energy sources sullies the real successes of the workers in low-impact energy industries. Our national parks do not exist in isolation. Air circulates, water flows, animals migrate and man-made pollution is indifferent to the boundaries it crosses, and the climate it alters, with effortless ease. It is long past time we all realize and accept this fact and acknowledge that it applies to all human activities. From solar panel manufacture to uranium mining, there’s no free lunch in our world. When we decide to build, we also have to decide what we are willing to destroy. Update, September 8, 2015: Now this from Harvard – “Hydroelectric energy may be more damaging to northern ecosystems than climate change.” Anyone who says Hydro power is “clean” or “renewable” or “green” is either lying or igorant. Reciting Beowulf as though I know what I’m saying. Some time ago I realized that when I read Old English (or Latin) verse out loud, I read as though I didn’t really know the meaning of what I was saying. I knew how to sound out the words and I even could offer a translation, but I didn’t actually sound like I meant it. I set myself the vague goal of someday really getting to know the first twelve lines of Beowulf so that I could say them with real understanding, conversational, the way I would read a passage from Shakespeare, or Yeats, or even Chaucer, not the largely bombastic declamation that often afflicts renditions of Beowulf. Remember: Beowulf is known to us not because rough, mead-swilling warriors enjoyed it, but because Medieval Catholic monks thought the poem was worth preserving. I suppose the seed was planted back when a mutual acquaintance got me together with David Ley for a brief bit of tutoring for his role as Hrothgar in Blake William Turner’s Beowulf the King. But I have to thank writer and fellow erstwhile Old English scholar Angie Abdou for really spurring me to get down to brass tacks and conduct the experiment. “Given wit and imagination, the Earth can be made vastly more hospitable for its dominant species and congenial life forms.” Small is beautiful but big isn’t all that bad either.” — “Terraforming the Earth” by Ralph Hamil, Analog Science Fiction/Science Fact, July, 1978, p. 65. 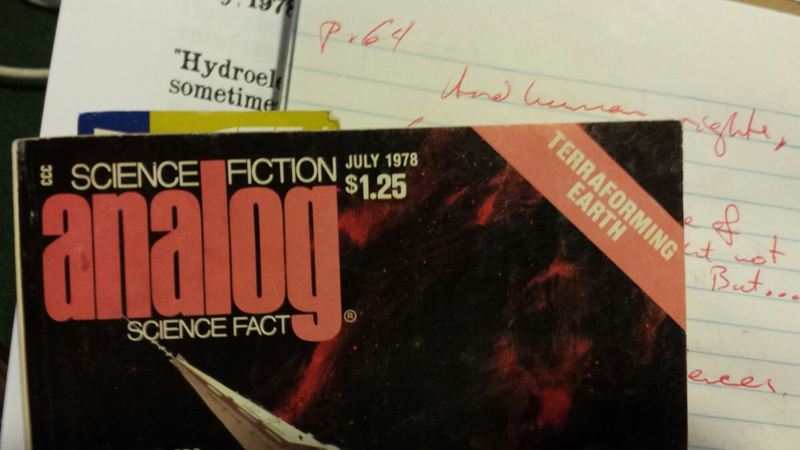 When I was a teenager in the 1970s, I was a science fiction geek. In my mind, tomorrow was a technologically and socially Brave New World in a very positive, non-Huxleyan sense. For a time I subscribed to Analog Science Fiction/Science Fact magazine. I look back at those magazines now and then. I see early publications by unknown authors such as George R. R. Martin and Orson Scott Card. And, I see the exciting predictions in the “Science Fact” department. An article that has troubled me for a while now is Ralph Hamil’s “Terraforming the Earth”, from July 1978, a few months before my seventeenth birthday — and a few months after I saw the future Captain of the Starship Enterprise on the Stratford stage playing the King of the Faeries. Hamil begins with praise of damming rivers: “Hydroelectricity is clean energy” but admits that “damming rivers sometimes leads to backwater sedimentation, rapid silting, and disruption of marine life and scenic quality. It frequently requires relocation of homes on about-to-be flooded land” (p. 48). I can’t help but think of China’s Three Gorges Dam, British Columbia’s proposed Site C Dam and the displacement and destruction caused by countless hydroelectric projects around the world. I wonder: is Hydroelectricity truly “clean energy”? “The scheme [to divert Russian rivers from the Arctic Ocean to central Asia] is faulted by those who fear that with a lessened flow of fresh water, the Arctic ice pack may shrink, with deleterious effects on the world’s climate. Some experts worry that the cool air above giant reservoirs would injure crops to the south while the added weight of the waters may stimulate earthquakes” (pp. 49-50). And it wasn’t just Soviet scheming. Hamil also references Newsweek’s praise of the North American Water and Power Alliance (NAWAPA) which would have diverted a number of arctic rivers, including the Mackenzie and the Peace (currently the centre of controversy over the abive mentioned Site C Dam proposal), south through the Rockies to the Fraser, Kootenay and Columbia and through extensions to the Rio Grande and East across the prairies to the Missouri and the Great Lakes. One third of the power generated by this scheme would have gone to pumping the water to unnatural places. But the U.S. Southwest would have irrigation water , For a time. What could possibly stand in the way of such a wonderful proposal? Well, next to cost, the biggest obstacle Hamil suggests is “Canadian reluctance to export its waters” (p. 49). Those shortsighted Canadians. What else would make Earth more hospitable? How about flooding 140,000 square miles of Brazilian rainforest? or damming the Strait of Gibraltar and the Dardanelles to generate electricity from inflow into an evaporating Mediterranean? or the more modest proposal of damming the Red Sea for the same purpose? Dam the Congo River and flood 350,000 square miles of Equatorial African Rainforest? Dam the rivers of the Indian subcontinent, including the Sacred Ganges? Dam the Bering Strait for goodness sake! On p. 52 Hamil suggests that “Mideast peace might someday join Israel, Lebanon, Syria, Jordan, and, perhaps, an independent Palestine in a Jordan Valley Authority for power generation and irrigation purposes.” The political foresight is as accurate as the environmental. Hamil lists all sorts of plans to make new salt lakes in below-sea-level areas of land and tells us, the Soviets “have rejected a plan to drain the Aral Sea.” p. 53 Look again! Iceberg dams for the Northwest Passage. Diverting the Gulf Stream to the Maritimes. Draining Lake Erie. The list goes on, blithely unaware of zebra mussels and Asian carp. Despite in the end explicitly denying an Asimovian dystopian vision, Hamil depicts a Trantor-like “Ecumenopolis” of 20 billion urban dwelling people connected by highspeed railways linking continents through trans-oceanic tunnels (many of which tunnels would be unnecessary if all the trans-oceanic dams got built). Whence the food to feed the urban billions? From all that newly irrigated desert and rainforest, one presumes. And there must be some nature reserves scattered about for those “congenial species” we’ve kept around. “By the first half of the 21st century . . .” atomic powered locomotives!!!! “Several of these stalled canal schemes might become feasible if nuclear devices could be used for excavation purposes” although, “The missing element of general world sanity may long inhibit such uses [of nuclear devices]” (p. 62). Because, I guess, the definition of “world sanity” is “using nuclear devices to blast canals through continents”. “If humankind is ever to get a handle on both short and long range climatic trends, it will have to utilize tools to alter productive forces in both these weather factories [the oceans and the icecaps] (p.62). Industrial complexes in the oceans!!! Cities on the ice of Antarctica and Greenland!!!! Towing icebergs to desert regions!!!!! “By the next century” !!!!!! Let’s get that Global Planning Commission going! “Sheer magnificence of imagination ought not to hypnotize us. But an emerging world civilization out to be capable of far more enduring works than its tribal predecessors with their meagre resources” (p. 65). Well, Mr. Hamil, it’s looking more and more like our emerging world civilization has indeed constructed those enduring works by means of our “terraforming” ambitions and their unintended consequences : climate change and extinctions. But somehow we haven’t made the Earth more hospitable for any species, “congenial” or otherwise. I suppose we lacked the wit and imagination. In 1978 as much as we do today.